The "school to prison" practices that have become so common place in disciplinary practices in schools all across America are about to end in school districts in Los Angeles. Students caught misbehaving in the nation's second largest school district will be sent to the principal's office rather than the courthouse as part of sweeping disciplinary reforms in Los Angeles schools. Under the new policy, police officers at Los Angeles Unified School District won't arrest or cite students for low-level offenses like possessing alcohol or marijuana but will instead refer students to administrators or counselors - a shift that educators and justice officials say will prevent students from becoming mired in the criminal justice system. 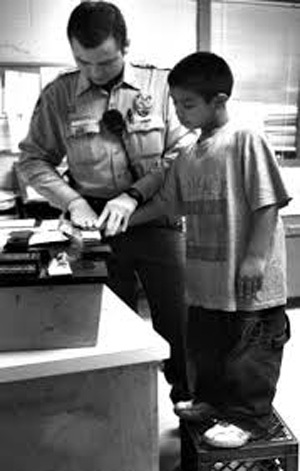 The decriminalization of student discipline marks the latest rollback to "zero tolerance" policies that were instituted in the 1970s and 1980s and intensified in the wake of the Columbine school shooting. School districts from California to Florida have instituted so-called restorative justice measures, which aim to address the underlying reasons for misconduct rather than mete out harsh punishments. The Obama administration in January issued recommendations favoring conflict resolution over arrests and citations. 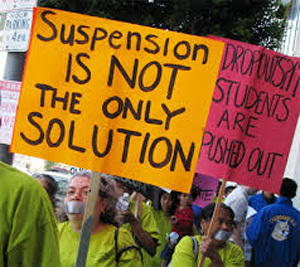 "We want students to be with us, not pushed out and sent to jail," Los Angeles Superintendent John Deasy said. "We have been disproportionately incarcerating, disproportionately citing, and disproportionately suspending youth of color, and it's wrong." With more than 640,000 students at nearly 1,100 schools and charter schools, Los Angeles is among the largest school districts to adopt less punitive discipline. The district's more than 350 officers make up the largest school police force in the country. "This is about changing behavior," school board member Mónica García said. "We're acknowledging we have young people who need guidance and an opportunity to learn from their mistakes." Dealing with repeat offenses isn't spelled out to give police and administrators greater latitude to address underlying issues. The goal was to provide "the most appropriate intervention," school police Chief Steve Zipperman said. "It really is in low-income communities of color that we've seen this increase in law enforcement presence," said Ruth Cusick, an attorney with pro bono law firm Public Counsel who helped negotiate the policy changes with the district's police force. Do you think other school districts school take similar measures as Los Angeles? In this article Los Angelos shows a large need for changing school age children's behavior between the ages 13-17 . So called defiant kids at first offense no matter how minor there actions have been being sent to their courts, and or ticketed for their actions at school. My feeling is that because the majority of these kids are low income, there may be a lack of direction and attention and or guidance in their homes. It makes sense to me to give kids the education support and direction they need to change their behaviors like Monica Garcia talks about. Sometimes lack of structure is what causes these types of behaviors in kids. I believe we need to give them an opportunity to change and let them know we all have choices, then if they become repeat offenders there may be a need for harsher punishments. Taking responsibility for one's action is taught, learning there are consequences for all actions is also taught. If the outcome we desire is law abiding citizens’. Shouldn’t we at least give these kids the opportunity to change? It should be a lot more cost effective as well. I could not agree more. I think that when kids act out at school they are just punished and sent on there way. No one takes the time to discuss the deeper issue at hand and how to correct there behavior. I think that if guardians got more involved and helped the educators address the child's behavior the child could get more control of their actions. To me when a kid is acting out it is a cry for help. By showing them that there is a different way to go about things and getting the attention they need and help form educators and guardians we can try and prevent behavior issues. I also agree with what was said about saving money by not going to court. I could not agree more that these students acting out may have to do with their lack of attention and guidance at home. I think when a kid acts out it is a cry for help. Where most educators punish the kid and send them on their way this is not helping the kid in any way. If they really understood why the kid was acting out in this way and got the guardian to help out they could address the real issue at hand and put an end to the kids behavior. I do not think it needs to taken to court unless like you said the kid is a repeat offender and all steps prior to this have been taken to try and discipline and help the kid. I don't think that other schools should take this approach. At the age of 13-17, we didn't have that in my school district. If students are defiant than there was a different alternative for them. In school suspension was one nobody was too happy for. So being tardy to class a certain amount of times caused ISS, or if you were considered truant than that automatically got you a day in school. After reading the article some questions came to mind such as, what’s the teacher to student ratio? Did anyone stop to think about the feeling that the students coming from low poverty feel? Are the teachers giving them all the information to become better than a student living in poverty? Does the teacher give them the TLC that is lacking in their lives? How would you act? How does arresting these students affect them? So if the students are probably getting arrested on purpose. That student could be living from place to place. But to get arrested and locked up he or she knows that they will receive three meals a day and have a place to sleep at night. Sometimes before taking action we have to stop and put our feet in the school of those kids. This article shows that the kids in the adolescent age is way out of control and this article had many good points and ways of demonstration. No matter what the action that someone does it seems to always be bad in this location. There are so many ways to improve this and I'm positive that these people are on their way. My beliefs are a lot like 14 that it has a lot to do with the low income of these kids and the way they are treated at home. A lot of the time low income families are those of broken homes, Single moms and single dads. In this case it becomes a problem because that single parent is a lot of the time trying to make a better life for their children by taking on two or maybe even three jobs. This becomes a problem because here is rarely any parental supervision. The child then finds ways to get attentions or is just simply broad and finds things to entertain themselves. That in my opinion is where most of this problem is coming from. No More Suspension! No More Jail! I am glad that Los Angeles is doing something about changing the way they punish misbehaved students. Suspension doesn't teach kids anything. It just simply mean that they will behave badly again. This new policy seems to aim at students from 13 - 17 years old. It is nice to see that a city is doing more to educate there students instead of placing them in jail. More schools around the country should follow this example.